Motherwort is a softly hairy perennial plant 3-5 feet high; the rootstock produces several erect, branched, square, hollow, grooved stems, often tinged with red-violet. The opposite, downy leaves are 3 to 7 lobed and sharply incised. Axillary whorls of bristly, two-lipped, red-purple, pink or white flowers appear from June to September. 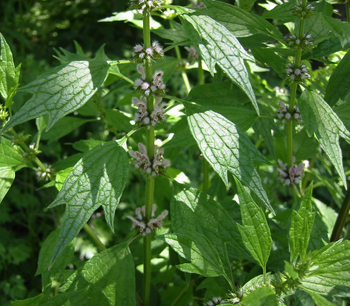 Unlike most plants in the mint family, motherwort has leaves that are strongly cleft or divided, not simple. The tiny pinkish flowers with furry upper lips are in whorls, in leaf axils makes a long leafy flower spike. Found mainly in the northern part of the United States and all over Europe, in waste places, vineyards, and along fences and paths. Native to Europe and the Far East, naturalized in other countries. Orientals ascribe to motherwort the power of prolonged life. According to Chinese legend, an emperor who at age seven assumed the throne was alarmed by predictions that he would not live to double that age. After an extensive search for a remedy to prolong life, he chose a brew made from motherwort. Drinking this every day, he lived past age 70. Another legend tells of a youth banished for a minor crime to a valley where the only water supply was in contact with a large amount of motherwort plants. Because he drank this water daily, the youth lived three centuries. This herb probably derived its name from the fact that it has been used medicinally to prevent miscarriage. Infusion: steep 1 tsp. tops or leaves in 1/2 cup water. Take 1 cup a day, unsweetened, a mouthful at a time. Decoction: boil 1 tsp. tops or leaves in 1 pint water until 1 cup liquid remains. Take 1/3 cup morning, noon, evening. Cold extract: soak 2 tsp. tops or leaves in 1 cup cold water for 8-10 hours. Take 1 cup a day. Tincture: take 9-15 drops in water, 3 or more times a day as needed. Contact with the plant may cause dermatitis in susceptible individuals. Do not use during pregnancy, it is a uterine stimulant. It may be used during labor and delivery. Seek professional supervision if pregnant or a heart condition is present.